After a home improvement/decorating project, you might find yourself with some partially full cans of paint that you’re not sure what to do with. Just dumping it down the sink or simply throwing the cans in the trash is NOT the way to go: Since paint can be a toxic substance, it’s important to dispose of it in a way that’s safe and environmentally friendly, according to Lowe’s. Luckily, it’s not too difficult to take care of leftover paint in a way that won’t harm the environment. 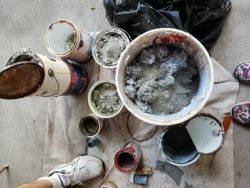 If you have a few (or more) cans sitting around that you’re looking to get rid of, here are some paint disposal steps to follow to ensure you do so properly. 1. Check the label for the age and type of paint. You’ll need to read the label on the paint can and note what kind it is as well as when it was made. Paint manufactured before 1991 might have mercury in it – and if you happen to have some really old paint (made prior to 1978), it might even contain lead, according to Consumer Reports. Paint that has either of those toxins in it should go to a household hazardous waste collection facility. Additionally, paint that’s oil-based (as opposed to latex paint, a.k.a. water-based paint) is considered a toxic substance everywhere in the U.S., so you’ll also need to dispose of it at a hazardous waste facility. To find one, you can search by zip code at Earth911.com and/or click on the “Paint Disposal” option under Quick Search. You can also call 1-800-CLEANUP (1-800-253-2687). Latex-based paints are also considered hazardous in select states (e.g., California), so it’s important to research the regulations and disposal instructions for your location. 2. Consider reusing or donating latex paint. 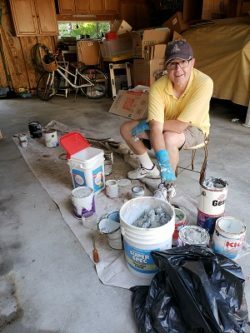 You can potentially mix together unused latex paints and reuse them for another project (although mixing all your leftover paint probably won’t produce the best color), according to Popular Mechanics. If you don’t want to use the paint yourself, you might want to contact your local schools, waste haulers, and/or municipalities to see if they have any paint collection programs for community projects. 3. Mix unwanted latex paint with cat litter. If you’d like to get rid of latex paint without taking it to a recycling center (and it isn’t considered hazardous waste in your state), mix equal parts cat litter and paint in the can, according to Lowe’s. If you have more than half a can left, pour the paint into a lined trash can or box to mix it. Note: If you don’t want to use cat litter, you can purchase a commercial paint hardener. Ensure that you stir the litter into the paint so that it’s thick and unable to spill, and then let the mixture sit for one hour. Once it’s dry, you can throw the litter-paint mix in the garbage. If you have any questions about proper paint disposal (or the right procedures for getting rid of other household materials), feel free to contact our expert Evanston-based senior move management team. We guide retirees, seniors, and families through the transition to a new home environment and/or lifestyle; our services include interior design. 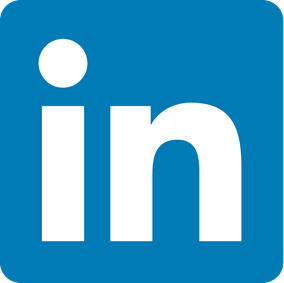 You can reach us by calling 847-769-2412 or emailing drina@dwelling-sp.com.